Als Schweizer: Ich sehe nichts falsches darin. It is truly incredible for me to get bureau administration. I trust you are giving the best and modest bureau administration for me. Much obliged concerning your news. I don't know if I'm the BEST bureau administration for you, but I'm absolutely the modest! Hehe. In Denmark it's the complete opposite - if you try to speak in Danish and aren't doing that well people will automatically respond in English. Makes the language hard to learn since you never get to practice it. Or sometimes, if you just speak English from the start, knowing they'll switch anyway, they act annoyed and inconvenienced as if you're demanding that they speak English. You can't win! This happens to me in Quebec on a frequent basis. To be fair, I can't say it's always the case though. I'm personally not confident enough in French to try to speak it in public situations, but sometimes I watch other non-Francophones really struggle to, say, order food in French - and the Francophone kindly obliges and doesn't switch to English. I'm getting to the point with my German now where if I start in German, they know I'm not a native speaker, but they don't switch automatically because they're not sure if I speak English or not! So I guess that's a win. Well, I think it's just good manners to ask if someone somewhere speaks a different language than the official one in somewhere. 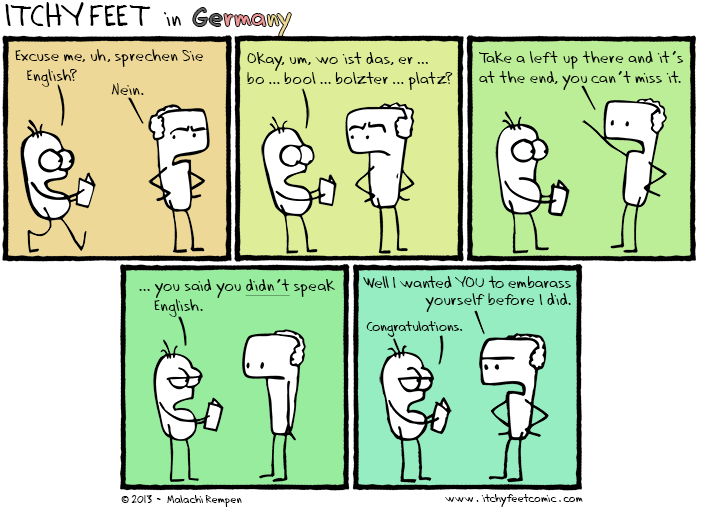 If I hadn't had the little English flag on my nametag where I used to work, I would have gone "Ich spreche kein Englisch" with everyone NOT asking first. And anyone who asked nevertheless got a "thanks for asking" and an extra smile - although I actually consider this act of interaction as being a basic thing. As funny as this strip is, there's not many people who are jesters like that in real life. So, Anonymous, you actually CAN win. And now imagine you being in your obviously anglophonic country and me coming up to you just going: "Entschuldigung, wo ist der nächste Geldautomat?" - How would you react?